A large leafy plant that can cause third-degree burns and blindness has been found in Virginia for the first time, researchers say. 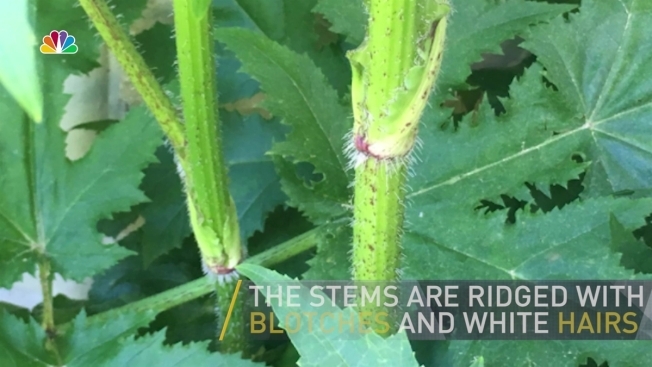 A patch of 30 giant hogweed plants were identified by Virginia Tech scientists last week in Berryville, Virginia, which is about 10 miles east of Winchester, the university announced. Giant hogweed can grow to be 15 feet tall. Its sap strips skin’s natural ability to protect itself from ultraviolet rays. It can lead to large blisters and severe burns, a University of Maryland Extension publication says. If the sap gets into one's eyes, blindness or sensitivity to light can occur. The plant makes poison ivy look tame, but one patch of plants shouldn't cause too much alarm, one Virginia Tech scientist said. “It’s a dangerous plant but I’m not overly concerned about it. This seems to be an isolated incident,” Michael Flessner, an assistant professor and weed specialist, said in a statement. The plant has clusters of small white flowers and serrated, pointy leaves that grow to 5 feet wide and look a bit like a maple leaf. Giant hogweed is in the carrot and parsley family and reportedly comes from the Caucasus Mountain region between the Black and Caspian Seas. It was introduced to the U.S. as an ornamental plant in the 20th century, the University of Maryland publication said. The plant can be confused with cow parsnip, which is native to Virginia. It is currently on the Virginia Invasive Plants Early Detection Species list, meaning it is not widely established in the commonwealth but is highly invasive in similar habitats. Giant hogweed is known to live in several neighboring areas, including Maryland, Washington D.C., Pennsylvania and most of New England. It's also found across New York state and the Northwest. It is believed that the giant hogweed in Berryville was planted intentionally decades ago, and hasn't spread since. The plant is especially problematic along the banks of waterways, because the seeds can float downstream for up to three days and can stay dormant in soil for up to seven years. Officials in Isle of Wight County, Virginia, said on Facebook that people should keep their eyes peeled for plants in tidewater and coastal areas. The Virginia Department of Conservation and Recreation investigates reports of the plant and takes action to eradicate it. If you come across this plant, you can report the invasive species here.